Under Contract in 12 days! Introducing 516 Sebastian Drive, Grovetown GA. This adorable and immaculate 3 Bedroom, 2 Bath home is move in ready and waiting for you! This home was built by Bill Beazley Homes and is located in Willow Oak Village. Home features Hand-Scrapped Hardwood Floors, Large Kitchen with Granite Counters, spacious Family Room, and a Sunroom that opens out into a Huge Backyard. Kitchen includes smooth glass-top range, stainless steel appliances and large kitchen sink big enough to soak a cookie sheet! 516 Sebastian Drive also features a spacious owners suite. The owners bathroom includes a large shower and extra shelves for organizing all of your towels and beauty products. Property includes a fenced-in backyard, concrete patio, additional concrete parking pad, along with an attached double garage. This one level home is located in Williow Oak Village and is convenient to Grovetown and Fort Gordon! See 516 Sebastian Drive for detailed information. Willow Oak Village is an established neighborhood in Grovetown. This home is convenient to Wrightsboro Road, I-20 , Fort Gordon Gate 2, William Few Parkway. Dining and shopping area nearby in Martinez and entertainment in the Evans area is only a short drive away. For more information about this home or any other Augusta GA homes, please call or contact Susan MacEwen. – See more homes for sale in Grovetown Willow Oak Village. Announcing 420 Keesaw Glen, Grovetown GA. 5 Bedroom, 3.5 Bath home is ready for you to move in and relax! This home was built by First Choice Home Builders in High Meadows and features a walk-out basement with lots of upgrades. Home features Heart of Pine Floors on the main floor, Large Gourmet Kitchen with Island overlooks Breakfast Nook and Great Room. 420 Keesaw Glen has a large owners bedroom and includes a sitting area! Master Bathroom includes a tiled shower and separate soaking tub perfect for soaking away the stress after a long day. The Walk-out Basement level include a 5th bedroom, full bathroom, media room and large family room that opens out into the backyard. Upstairs on the main floor you have the gourmet kitchen with breakfast nook, dining room and living room with a balcony that overlooks the backyard. Perfect for that morning cup of coffee! See 420 Keesaw Glen for detailed information. High Meadows is the perfect neighborhood in Grovetown off of William Few Parkway. This home is convenient to William Few Parkway, Columbia Road and I-20. Patriots Park and Bartram Trail Golf Course are within 1 mile and entertainment in the Evans area is only a short drive away. For more information about this home or any other Augusta GA homes, please call or contact Susan MacEwen. It is no secret that Grovetown is the fastest growing city in Columbia County, which explains all the new homes in Grovetown. Both I-20 and Fort Gordon are easily accessible from Grovetown making it popular with not only the military but also health care works that commute to the Augusta Medical District downtown. There are beautiful executive style homes to charming patio homes – which means there is something for everyone! Grovetown can be divided into two parts – one part is “north” of I-20 and borders Evans and the other is “south” of I-20 where the City of Grovetown is located. Both areas offer many new subdivisions with new homes in Grovetown available. While looking for your next home, please consider your “must have” list when choosing a neighborhood. If you are looking for a neighborhood with lots of amenities – swimming pool, walking trails, play ground – then be sure to check out Canterbury Farms, Hidden Creek, Tudor Branch and Grove Landing. Neighborhoods with at least a community swimming pool include: High Meadows, Chastain Place, Magnolia Station and Lakeview Commons. There are many choices for new homes in Grovetown as you can see. If you need someone to help you with buying a new home, please give me a call at 706-294-6795. Announcing 4469 Country Glen Circle in Grovetown GA! This Beautifully landscaped better-than-new, all Brick Ranch style home located in Euchee Creek Subdivision is Move-In Ready and waiting for you! Enjoy the Screened Porch and backyard barbecues under the Covered Patio. This 3 bedroom is a split floor plan and was built in 2009. The kitchen features beautiful Granite counters and Stainless Steel Appliances! For more information about 4469 Country Glen Circle or any other Grovetown GA homes, please call or contact Susan MacEwen. Use link to View All Euchee Creek Homes for Sale. 1202 Stone Meadows Court, Grovetown in Canterbury Farms! Announcing 1202 Stone Meadows Court, Grovetown in Canterbury Farms is available! 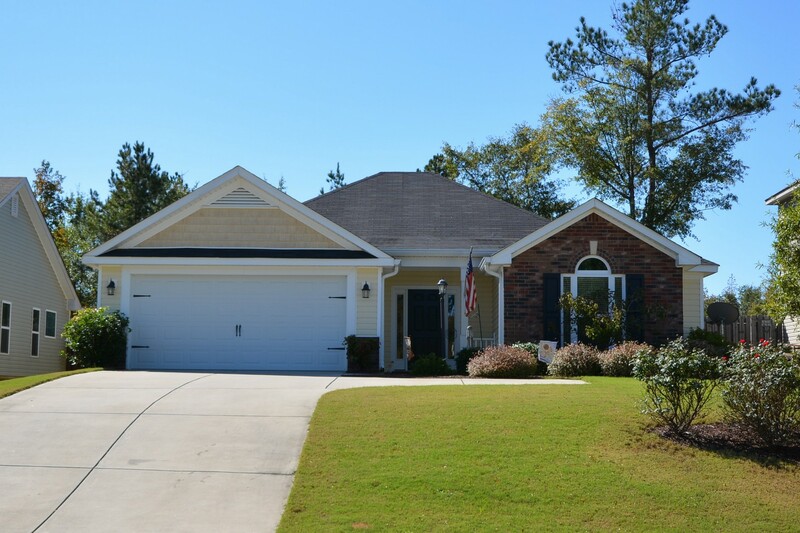 This lovely home for sale in Canterbury Farms, Grovetown is now available. The 4 bedroom, 2.5 bath home is located in the Lancaster section of Canterbury Farms, which is on the left just past the community pool. It is an Energy Star Constructed house by Winchester Home Builders and features an open floor plan. For more information on 1202 Stone Meadows Ct or any other Canterbury Farms home, please call or contact Susan MacEwen. See 938 Cannock Street in Euchee Creek Subdivision in Grovetown, GA! This Home for Sale in the popular Euchee Creek Neighborhood in Grovetown features a brick exterior with an extended driveway perfect for parking your camper or boat. This is a 4 bedroom and 2 and a half bath home with the Master Bedroom on the Main floor. It has a large kitchen that includes a breakfast nook and stainless steel appliances. The yard is full landscaped and includes an in-ground irrigation system for both front and back yards. Euchee Creek is zoned for the Columbia Schools of Cedar Ridge Elementary, Grovetown Middle School and Grovetown High School. For more information about this home, please call me at 706-294-6795. Crown Communities is now building new homes in Grove Landing! Crown Communities is proud to announce the addition Grove Landing to its available communities. Grove Landing is a master-planned subdivision situated on 120+ acres located in Grovetown, GA. Grove Landing offers its owners and residents wonderful amenities including a Community Clubhouse, Swimming Pool, Stocked Fishing Pond and nearby access to Walking Trails! Grove Landing is a few minutes from the Gate 2 entrance to Ft Gordon and access to I-20. New Crown Homes pricing is starting in the $150’s making this an excellent value in this fast growing neighborhood! This Columbia County neighborhood is located close to Grovetown Middle School and Cedar Ridge Elementary. Grove Landing offers great value in a prime location. From Fort Gordon: From Gate 2 of Fort Gordon take Robinson Ave to Harlem-Grovetown Rd and Wrightsboro Rd. Turn left at the light on Harlem-Grovetown Rd. Grove Landing is on the left just after Grovetown Middle School. Take 2nd Right on Grove Landing Lane then turn Left on Grove Landing Circle. Model home is located on right at 3317 Grove Landing Circle right across from the Pool. Other: Take Wrightsboro Rd to Grovetown. At Light near IGA, stay straight on Harlem-Grovetown Rd. Grove Landing is on the left just after Grovetown Middle School. Take 2nd Right on Grove Landing Lane then turn Left on Grove Landing Circle. Model home is located on right at 3317 Grove Landing Circle right across from the Pool. Now that winter seems to have disappeared and spring is here in full force, I would like to take a look at the Grovetown Residential Housing Market for the first quarter of 2011. Please remember we had the First Time Home Buyer Tax Credit available during the first half of 2010 when comparing the numbers from 2011 to 2010. Both High Meadows and Canterbury Farms continue to be popular. I do expect High Meadows’ sales to slow down in the coming months when the subdivision is completed. Pamir Place still has approximately 10 lots remaining and expects to be completed in a couple of months. If you have any questions or would like more information please contact me. Come see this beautiful Model Home in Pamir Place this weekend. Pamir Place features the Lexington Plan as it’s model home complete with an open floor plan. The Lexington has 4 bedrooms and 3 full baths with one bedroom and bath on the main level. The large, open kitchen has a large kitchen island, granite counters and tiled backsplash opening into the open 2-story family room. Come see the stunning arches leading into the dining room as well as the upper catwalk overlooking the family room. Pamir Place is Crown Communities most affordable Columbia County neighborhood! Directions: From Grovetown take Harlem-Grovetown Rd past Grovetown Middle School and Euchee Creek Park. Take Right at 2nd entrance into Pamir Place. Turn Right then take Left onto Lory Lane. Model Home is on the Corner of Lory Lane and Congling Circle. Hidden Creek is one of the newest Planned Communities that is located with the Grovetown, GA residential housing market. The subdivision features two builders: Blue Ribbon (aka JJ&Z) and Wilson Parker Homes. Wilson Parker Homes will range in size from 2,400 square feet up to almost 4,500 square feet. These family friendly homes will be built in a Craftsman Style and will range from a Ranch style to 2-story and 3-story floor plans. Blue Ribbon homes will range in size from 1,200 square feet up to 2,300+ square feet. These homes will be 1-story and 2-story homes. The neighborhood amenities of Hidden Creek will feature a junior olympic swimming pool, club house, and playground with a walking track. Grovetown’s newest Elementary School will be adjacent to the neighborhood and within walking distance. Grovetown High School is just minutes around the corner off of William Few Parkway. The residents of Hidden Creek will enjoy easy access to I-20 and Ft Gordon. For other activities, Patriot’s Park and the Bartram Trail Golf Course are only minutes away. Blue Ribbon Builders and Wilson Parker Homes have homes that you can currently see in High Meadows. They have begun construction in Hidden Creek and should be ready to see by this summer. For help with purchasing a new home or resale home, please send me an email or give me a call on my mobile at 706.294.6795.